Does your shower get soap scum and hard water scale? Do you hate to buy high-priced commercial shower cleaners at the store? Would you like to avoid washing harmful chemicals into your septic system? If so, try this homemade shower cleaner. This basic recipe has been around for a while but we have added a few tweaks. This homemade shower cleaner uses Dawn and vinegar. You may have seen these same ingredients mentioned on other blogs. It is popular because it works. Our particular version is different in that we are using any color of Dawn Ultra and Heinz Cleaning Vinegar. As we stated in the Dawn article, we do not believe that there is any significant difference in the cleaning powers of the various colors of Dawn Ultra. So for this recipe, you can use the blue, yellow, or the new Dawn Destinations, which comes in several exotic colors and scents. Do not use the Dawn Antibacterial that currently comes in orange and green. These formulas contain the anti-bacterial chemical chloroxylenol. If you dump large quantities of chloroxylenol into your septic system, it could kill the beneficial bacteria that break down organic waste. This could damage the efficiency of your septic system. Antibacterial soaps and detergents are useful products in some applications, but shower cleaning is not one of them. The Heinz Cleaning Vinegar is used because it has extra strength to dissolve tough soap scum and lime scale deposits in your shower. The homemade shower cleaner recipes on a lot of websites call for a 1:1 ratio of Dawn to vinegar. I feel that this is way too much Dawn. Not only does it waste your expensive Dawn, but it takes more water to rinse off. Therefore it wastes water as well. This recipe uses a 1:3 ratio of Dawn to vinegar. This means if we use 1 cup (8 oz) of Dawn, then we will dilute the Dawn with 3 cups (24 oz) of vinegar. This would make a total of 32 oz (1 quart) of homemade shower cleaner. In my opinion, this ratio results in a more effective product that is cheaper and easier to rinse off. Right now I am using a Zep Professional 32 oz spray bottle to hold my homemade shower cleaner. You can buy these at Home Depot. 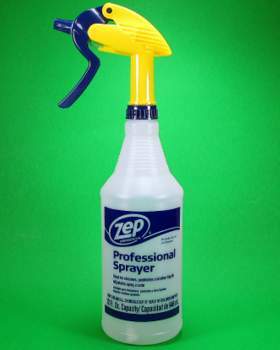 Some people say that this cleaner is hard on the cheap spray bottles and that this Zep bottle holds up better. This spray bottle also has a long trigger that is ergonomically designed to be easier on the hands. One pull on the spray handle dispenses a lot of product. This is good if you have arthritis or carpal tunnel syndrome and don’t want to do a lot of repetitive squeezing. The jury is still out on this bottle so let me know how it works out for you. I am loving mine so far. I want to give thanks to Jamie Tarence of Family Savvy for introducing me to this bottle in her shower cleaner article. Start by pouring 1 cup of Dawn into your 32 oz bottle. Then fill the bottle to about halfway full with the Heinz Cleaning Vinegar. You can heat up the vinegar to make it easier to mix if you want to. I have tried mixing it cold and it will still mix up but it is definitely easier to mix with warm vinegar. There is no need to get the vinegar boiling hot. Only heat it to the point to where it is still safe to handle. 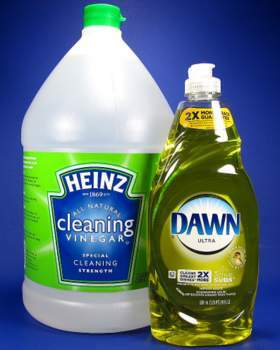 Add a cup of Dawn to the bottle then fill the bottle to about halfway with the cleaning vinegar. Now that you have the bottle halfway full, mix up the solution by using a swirling motion. Do not shake it as this will make too many suds. Here is an animation that shows the swirling method. If you heated the vinegar, this won’t take very long. If you are mixing it cold, it will take a little longer. Continue swirling until it looks like it is completely mixed up. Now you want to go ahead and fill the bottle the rest of the way up with vinegar. 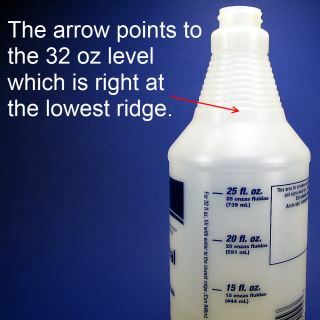 There is writing on the bottle that states that the lowest ridge is 32 oz. The picture on the right shows where this spot is. You don’t have to get it exact. Just be sure to leave a little room at the top so that you can mix it up once you pour the rest of the vinegar in. 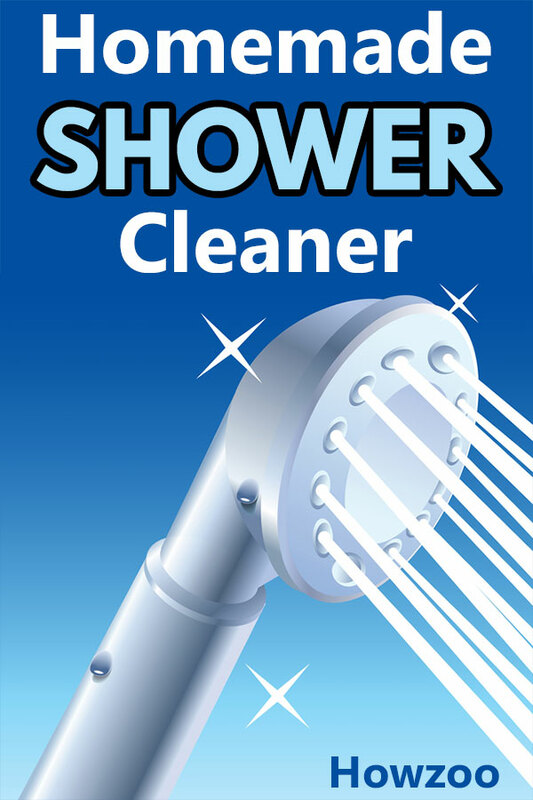 Gently mix the shower cleaner by turning the bottle upside down and back upright a few times until it is well mixed. Do not shake. After the cleaner sits for a while, it has a tendency to settle. So it is a good idea to mix it a little every time you use it. The first thing that we need to do is label the bottle. Refer to 4 Ways to Label Homemade Household Cleaners for a list of options. This is a very important step from a safety standpoint. The second thing I want to mention is ventilation. This homemade shower cleaner is very potent and gives off some very strong fumes. You will want to run the bathroom vent fan when using this cleaner. It may also be a good idea to open some windows to let in some fresh air while this stuff is in use. I am not kidding, this stuff is strong! The third thing to think about is eye protection. This cleaner is not something that you want to get in your eyes. I highly recommend wearing safety goggles while spraying this in the shower. If you do accidentally get some of this in your eyes, flush your eyes out with water out of the tap. The fourth thing you want to do is wear some rubber gloves. The long ones that go well past the wrist are best. Vinegar is an acid and can actually cause mild acid burns or other skin problems. I know of three ways that you can use this homemade shower cleaner. You can put the shower cleaner solution in the dishwand and scrub the shower walls with it. You press the little button to release more cleaner when you need it. A lot of people have discovered the dishwand shower-cleaning method and swear by it. Be careful with this method though. Green scouring pads can scratch. 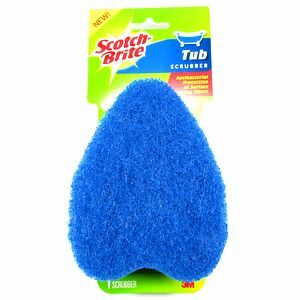 If you are concerned about scratching, use a blue pad like the tub-scrubber below. This is my favorite method. 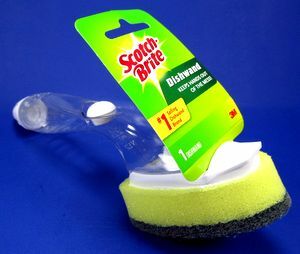 I picked one of these Scotchbrite Tub and Shower Scrubbers at Dollar General. I like it because I can spray down and scrub the entire shower really quick.It works faster than the little dishwand. I guess that is why the dishwand is for dishes and the tub and shower scrubber is for, well, tub and showers! You could just spray this on, let it sit a few minutes and then rinse it off. You would probably need to scrub the shower clean the first time to get the really tough soap scum and hard water stains off. Then you would maintain it with regular use of this diy shower cleaner. Be aware that this will probably be the smelliest of the three options. If you are a stay-at-home spouse, you would probably want do this during the day while the kids are at school and the spouse is away at work. I hope you like this homemade shower cleaner. Please feel free to comment with your observations, suggestions, and ideas. Thank you for the very informative and thorough article! I especially appreciate the clarification on ingredients and tools for application. Can’t wait to try this today! Would this work for windows also? I have never tried it on windows but it might be useful if the windows were very dirty, like pulled-out-of-a-barn dirty. Otherwise, I would just stick with much a lighter cleaner for everyday window-cleaning. I found this recipe for cleaning windows: 1 gal water, 2 T Jet-Dry and 4-6 T Dawn…..spray water on window, spray solution – I used the same type of scrubber as recommended for this shower recipe – spray off with water and let it air dry. Don’t wipe windows dry – makes a mess. Interesting window cleaner recipe, particularly with the addition of the Jet-Dry. Thanks for the info. Is it only for use on ceramic or porcelain tubs, or will it also work on fiberglass tubs, as well? It works great on fiberglass. I can’t wait to try this. I have MS and it is hard to keep up with the shower and tub cleaning. Thank you for this great article , easy to understand. Where do you buy cleaning vineyar. Check out the Heinz Cleaning Vinegar page. It has some information about where to buy it. In a nutshell, it’s ok to use regular vinegar if you can’t find the extra-strength cleaning vinegar locally. Some Walmarts have it but some don’t. You can buy it online if you are wealthy and don’t mind paying $40 a gallon! I just purchased my gallon of Heinz Cleaning Vinegar from Amazon on Monday of this week – $20 and that included the shipping! Thanks for the information. I think I will update the Heinz Cleaning Vinegar article with this information. I bought mine from Walmart, it was less than $10. I made this cleaner & cleaned our fiberglass tub & shower, it worked really well. Didn’t have to do much scrubbing just wiped it down & sprayed it off & done. Does this work with new Dawn Platinum dish soap? You could use Dawn Platinum but I would recommend using the Dawn Ultra because it is cheaper. It is the Heinz Cleaning Vinegar that is removing the soap scum. The Dawn is in there to help wash it away after it is removed. Dawn Platinum is a superior product for washing dishes, but I don’t think you would gain anything by using it in the shower cleaner. No. Do not use this on marble. The vinegar is an acid and will corrode marble. What about scum on shower doors, how well does it work? It should work well. The vinegar is acidic and dissolves the soap scum. If it is really tough, try some Barkeeper’s Friend with a blue non-scratch scouring pad. Is there anything wrong with using plain old white vinegar?? The Heinz cleaning vinegar has 20% stronger acidity. The acid is what dissolves the soap scum. So the Heinz cleaning vinegar dissolves the soap scum better. If you want to save money, you could use the plain vinegar. It might not work as well, but it should still work. Wonderful informative comments. I use the vinegar and Dawn cleaner in the tub & shower but also spray on porch / hose off to remove moss & stains. (W WA) I buy powdered vinegar by the lb online. Very cost effective. 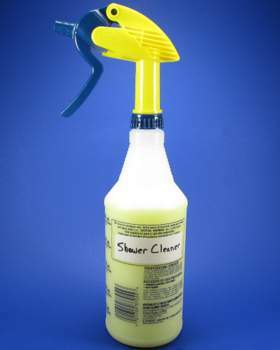 Can your homemade shower cleaner be used on acrylic showers as well? I diluted the solution and it works! Although, I still got A LOT of suds. Had to use a lot of water to rinse. I did the walls of my shower, as well as the tub, though… Also, it stopped up my sprayer… so, I had to switch to a scrubber that you can fill with solution. That worked, but it was a lot more work than just simply spraying and walking away. I mixed this up today and unfortunately, I must have twirled it too much. It has so many bubble suds in the bottle I can’t get the rest of the vinegar into my bottle. Is there a secret method to get those suds to go down quickly? It hasn’t changed in hours!!! I don’t know of a way to make the suds go down quickly but what I would do is just put the bottle in the kitchen sink and carefully pour in the vinegar while the suds overflow the top. It won’t hurt to lose a few of the suds.